Camarillo Springs Ranch is a peaceful place where horses are relaxed, people are friendly, and trails meander through the hills and valleys making this an ideal place to relax and rejuvenate. 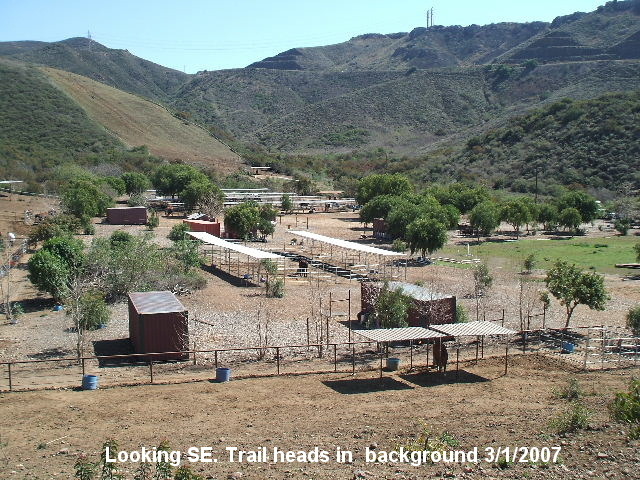 1000+ acre ranch nestled in a quiet coastal valley north of Los Angeles County between Camarillo and Thousand Oaks in Ventura County with miles of trails on the ranch and in adjacent Open Space. Clear skies, moderate coastal temperatures, easy access: Camarillo Springs Ranch is a quality retirement, boarding and lesson ranch which offers premium care, and safe, direct access to private and public trails. I am writing this to recommend Camarillo Springs Ranch as an excellent horse boarding facility. I have had my 3 horses boarded there and first moved in 7 years ago. I have an older horse with special medical needs. His care has been exceptional. He is always monitored closely and treated appropriately. I have always felt as though his treatment is a privilege rather than a burden by Larry and Jody. He is doing very well and the vet is pleased and somewhat surprised by how great he looks. I credit Jody, Larry and myself for that, as we all work together as a team for the good of the horse. Another facility was 5 miles closer to my home but I would not give up the wonderful environment and exceptional care we received at Camarillo Springs Ranch for a shorter drive. Not only is the treatment and care of the horses outstanding but the trails are beautiful and abundant and the family atmosphere is supportive and fun. I am happy to endorse Camarillo Springs Ranch and the exceptional, personal care given to the horses by Jody and Larry and their wonderful staff. Copyright 2016 Camarillo Springs Ranch. All rights reserved.